Hi guys! 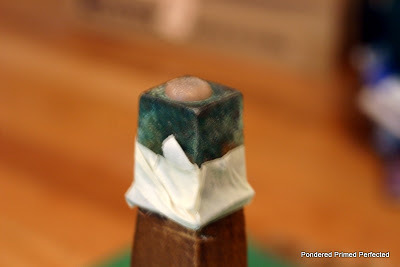 Sherry of Pondered Primed Perfected is back with another great post! 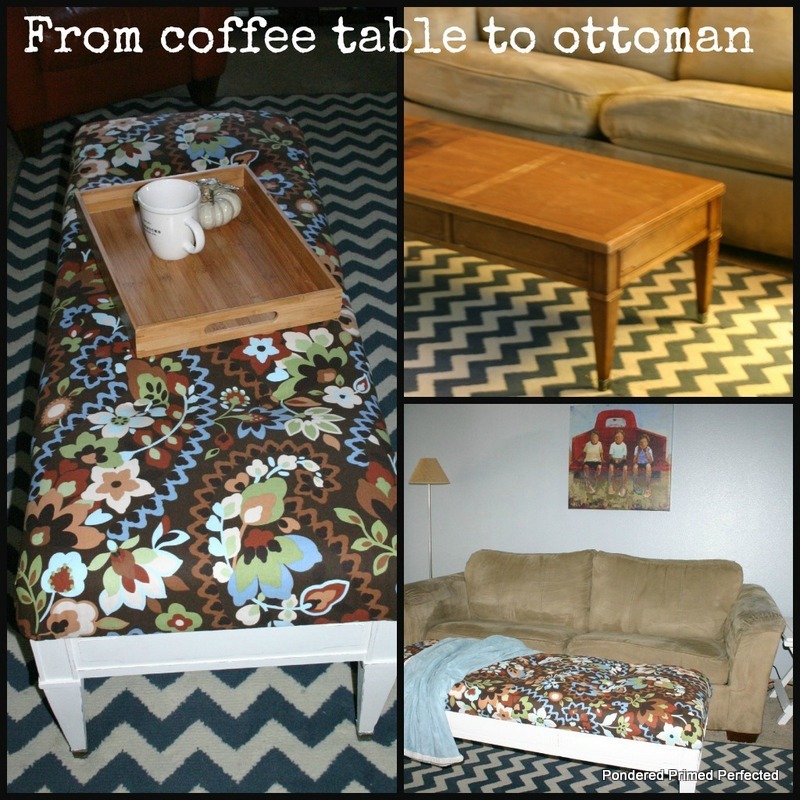 I’ve been dreaming of turning an old coffee table into an ottoman for a long time. 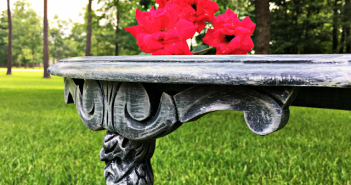 I spent many a summer weekend scouring yard sales, just hoping to find the perfect table. 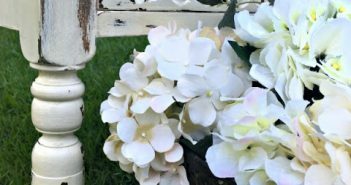 Isn’t it funny how you can come across a certain type of item over and over again…making you wonder what on earth you could re-purpose it into…then when inspiration hits you there’s suddenly none to be found anywhere? That’s when my Better Half came home with this beat up old beauty. 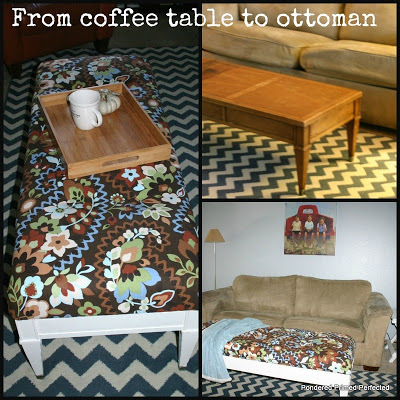 Just when I’d resigned myself to living without a coffee table ottoman. 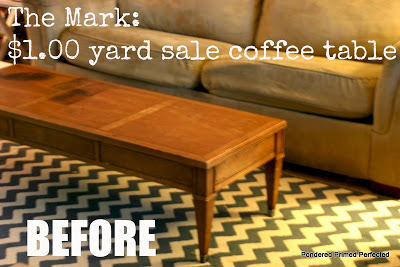 He found this solid wood coffee table at a yard sale for $1.00 and brought it home to me. Perfect price. Perfect height and length. Looks like I have my next makeover mark! 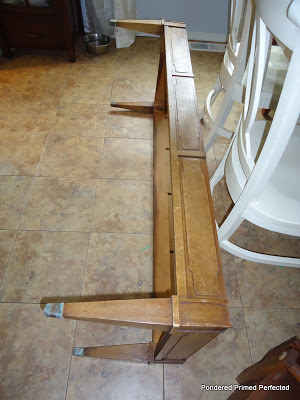 I flipped it over and unscrewed the table top. It had to come off so I could paint this base. 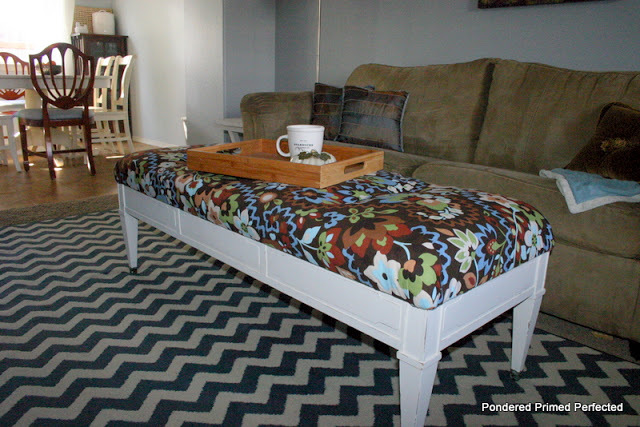 I also needed to add foam and staple the upholstery fabric directly to the under-side of the table top which would be much easier with it off. Do you see the patina on those little copper feet? You can’t fake that. So pretty. I taped those tapered copper feet off before painting the base. I wanted the patina to stay. I whipped up some homemade chalk paint with some Metro Recycling Center white paint and unsanded grout. 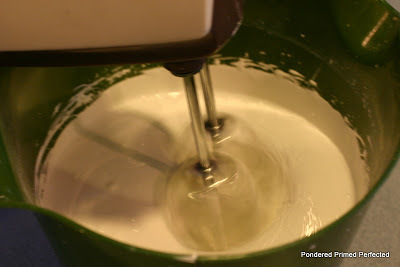 I used a hand mixer to get it nice and smooth. I did three coats to give the table good coverage. I distessed a bit once it dried. Then we went shopping for some foam. Egads! Have you priced foam lately? 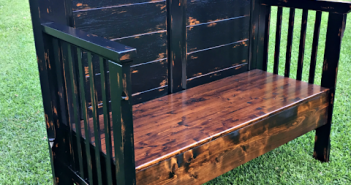 It was $34.99 a YARD. You’ve got to be kidding me! This is supposed to be a thrifty makeover. We ended up finding an Ikea crib mattress still in the store wrapping for $7.00! This left us needing only 7 inches of foam from Joann’s to cover the tabletop. 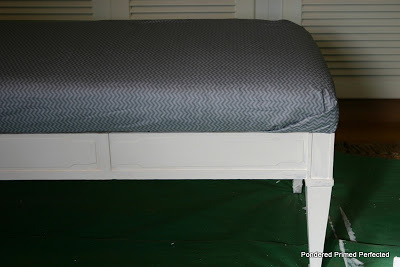 I used a cloth shower curtain I had to upholster the mattress and foam to the tabletop. I needed to merge the foam and the crib mattress together and add a bit more padding to the top. I stretched this white fabric over the foam and stapled underneath the table top…pulling tight as I went. This did the trick. I love the look of the white but I know it wouldn’t be this pristine for long around here. I only wish! I sampled this grey chevron fabric also, but decided it was too light weight to stand up to all the heavy foot traffic. 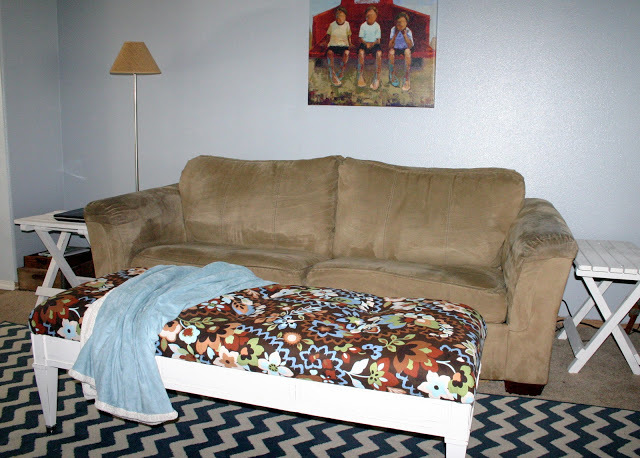 After I added the foam and the white shower curtain fabric I stretched my upholstery fabric over the top and stapled underneath. Again pulling tight as I went. After adding the button tufting I screwed the top back onto the base. This graphic fabric is a Cynthia Rowley curtain panel I picked up at Goodwill for $6.00/pair. I had pre-measured and drilled six holes into the tabletop before adding the foam and fabric. I used the fabric covered buttons to tuft the ottoman. Here’s a good button tufting tutorial if you want to give it a try. 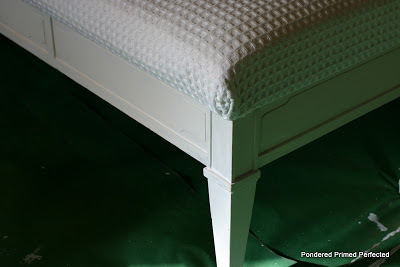 I love the tufted look on ottomans and would have loved to do MANY more buttons…but we were going for thrifty here. Sadie was determined to be in every picture. I had to lure her out of the way with treats. Hey! Smarty pants dog! She thinks she’s so smart. We now have a soft place to put our feet up and relax! It’s wide enough for everyone to share AND extra room for a tray. For less than $30.00 we have a large, custom, tufted ottoman. Sherry, WOW! 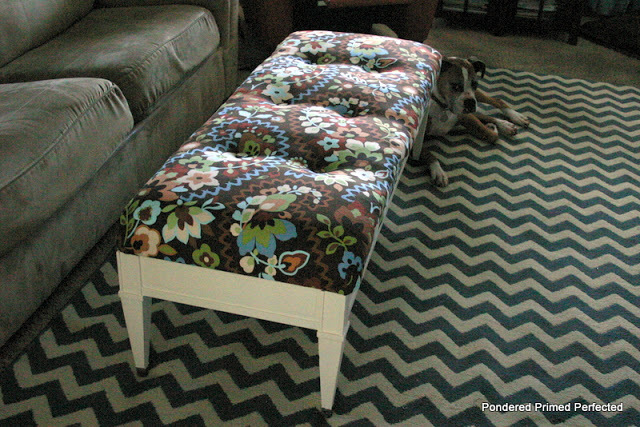 That ottoman turned out so great! 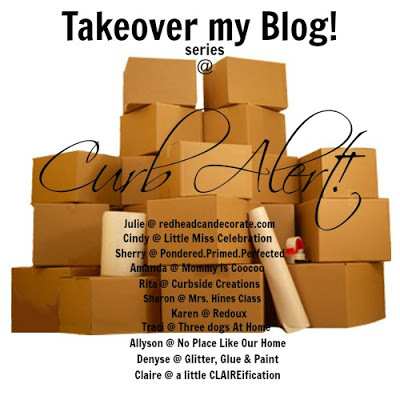 Thanks so much for taking over my blog this week! Really cute! I think I have that same table! Thanks for letting me take over again! 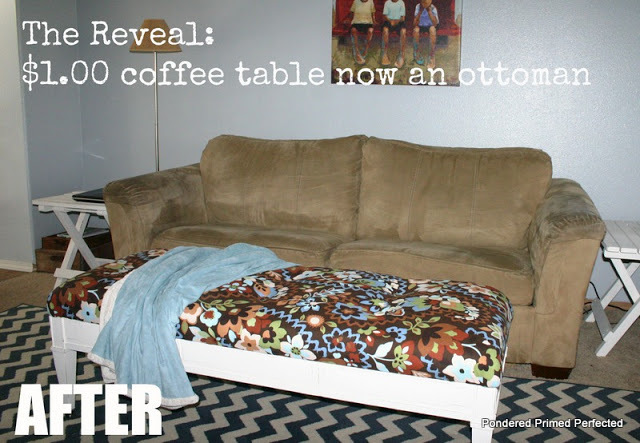 This was a fun project and a real life saver in our home. A coffee table MADE for putting your feet up…Perfect! 🙂 Have a great day Tami! beautiful, and a great price, love it !!! If you aren't lucky enough to find a 7.00 crib mattress, an old ugly pad from an outdoor lounge chair might do the trick as well. I'm all about thrifty! (as long as it doesn't smell!!!) Great idea! It would make a wonderful window seat as well. 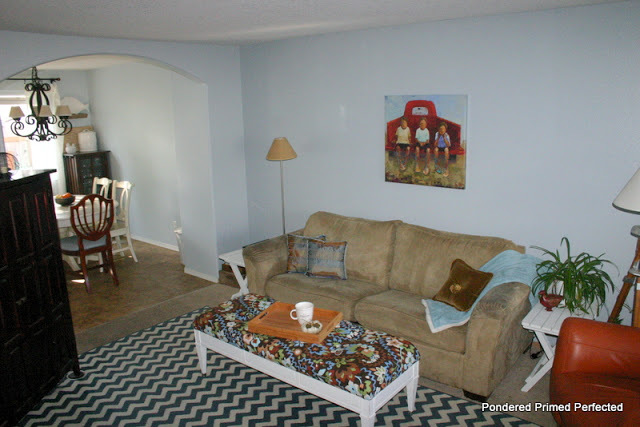 I love how the colors in your ottoman pull out the throw on your couch and the canvas above the sofa. The color is in all the right places. I'm about to do the same project, btw. 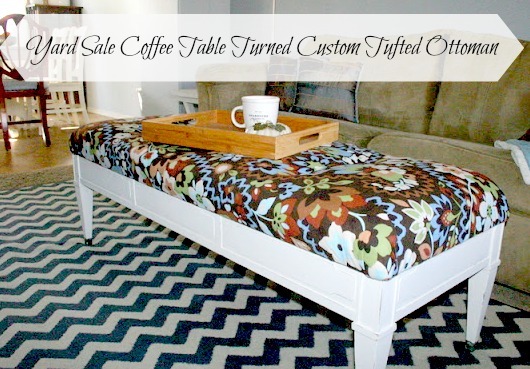 I'll be sure to check out your tufting tutorial.